Fridge organization is at the top of my list when back to school time hits. Organizing my fridge and giving it a refrigerator makeover so to speak, enables me to present easy lunch options for my kids and keep us all on track and organized during busy mornings. 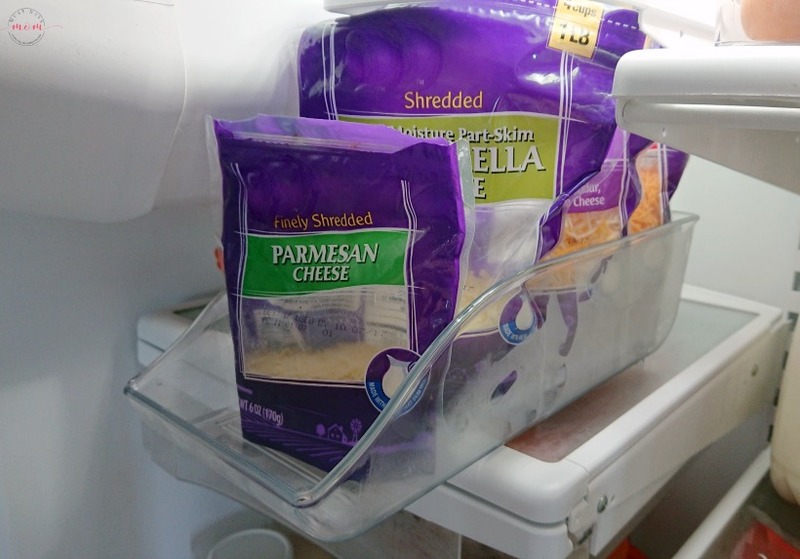 I’ll share my favorite fridge organization hacks for busy families with you so you can get organized in a hurry too! 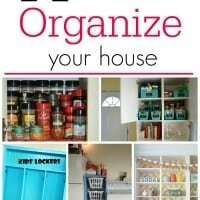 With back to school time I definitely get in the mood to organize everything. 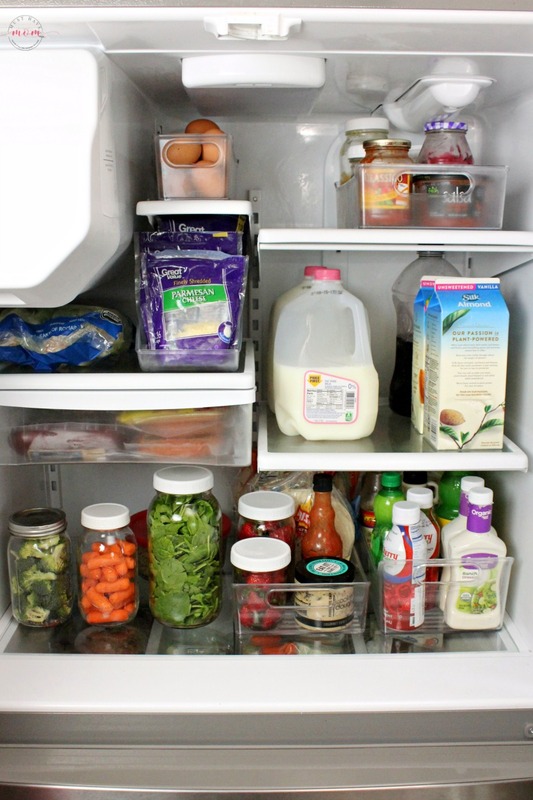 I started with my fridge and I have some very useful hacks you can put to use in your fridge and make navigating it easier for the whole family. No more yelling “MOM where’s the yogurt?”. I set out to organize everything and make it easy to see and user-friendly. 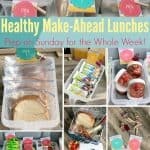 After I was done my kids were able to easily pack their own lunches by simply grabbing everything I had out for them. If you don’t trust your child’s ability to pack a healthy lunch on their own then try my genius printable lunch packing system so they can choose their own lunch within the parameters you set up. Now on to my fridge makeover before and after photos. Above is my VERY messy, disorganized fridge where no one in my family could find anything they were searching for. After implementing my organizing hacks I have listed below my fridge looks like the photo above now instead of the crazy messy first photo! I LOVE it and so does my family. It’s organized and easy to find things in. The best part? It takes hardly any time to implement this! We also have a snack drawer in our fridge which was a general mess!! But after I organized it the kids were now easily able to pack their lunches from it! Say goodbye to crazy mornings and hello to quick and easy lunch packing and easy after school snacking! Mom for the win. 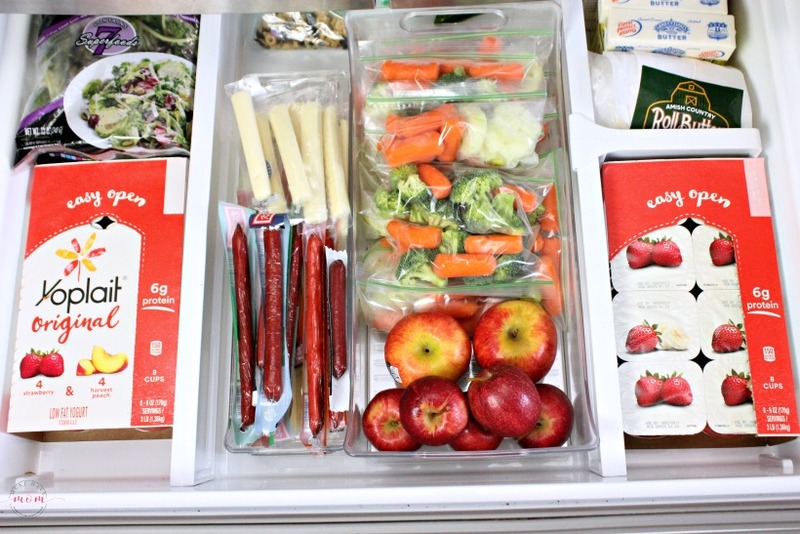 To start out with my back to school fridge organizing I picked up some easy snacks and lunch food that the kids could just grab and go with on their own. These new Yoplait yogurt packs were exactly what I was looking for. They have been designed so you can easily identify the flavor from the image on the top (hooray for my little ones who can’t read yet!) and they peel open so you can easily grab them straight from the package. I picked up an Original Strawberry/Peach 8 pack and an Original Strawberry Banana 8 pack, but had a hard time picking just two because there are so many yummy-sounding flavors! I already had on hand beef sticks, string cheese, veggies and fruit. I also had frozen PB&J sandwiches in the freezer (prep them Sunday and they’re ready for the whole week!) so with the addition of the Yoplait yogurt packs we were set for lunches! Grab an empty egg carton and cut off the lid. Place it in your refrigerator’s condiment shelf in the door of your fridge. Then, add your nearly-empty condiments to it and turn them upside-down so they are ready to use whenever you grab them. The egg tray underneath will catch any drips or leaks that may come out which keeps your fridge clean and cuts down on spills! While I was at Walmart buying Yoplait yogurt packs I also picked up some of these fridge organizing bins. I used this one to put my eggs in. 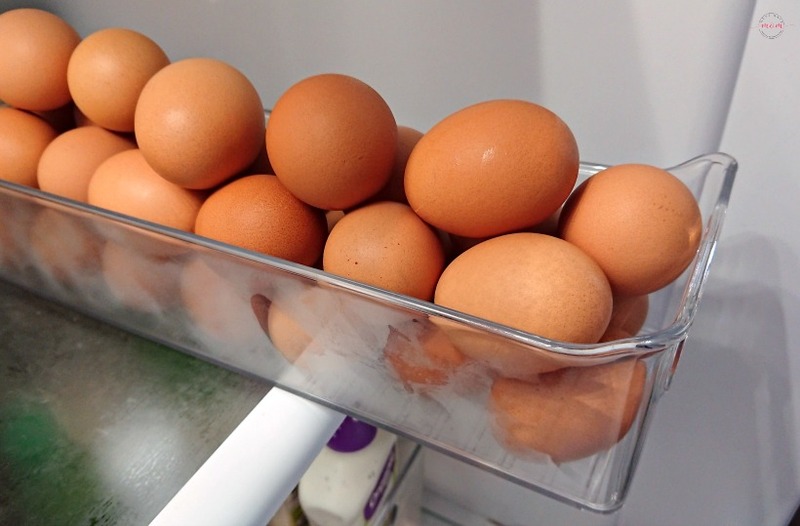 I always have 3 dozen eggs in my fridge because as a family of 6 we go through a lot! The problem is, they take up a lot of shelf space. By removing the eggs and putting them in a bin we save a lot of shelf space and they are easier to grab too! If you’re worried about knowing the expiration date you can just write it on the bin with a dry erase marker. 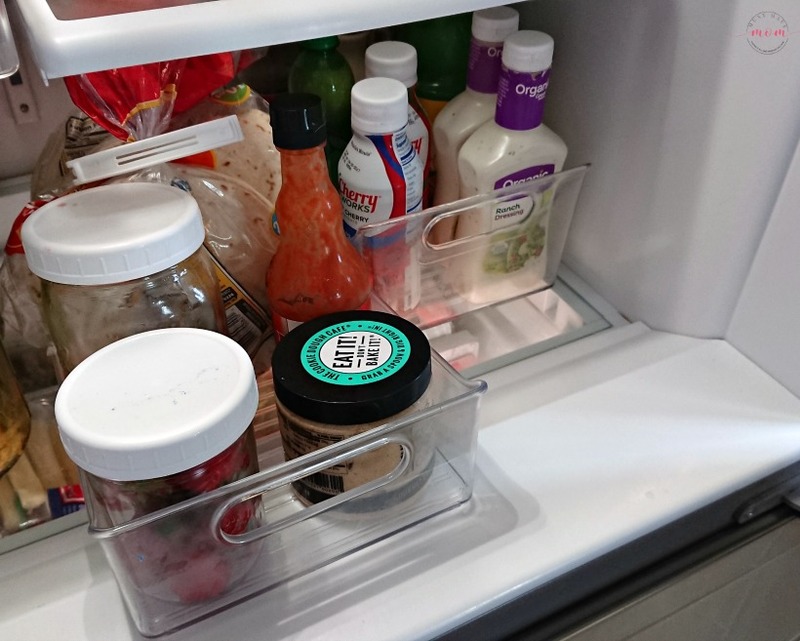 I also used the larger fridge organizing bins to organize my condiments and various other small items in the fridge. These things tend to get lost in the back of the fridge or pushed around all the time. By putting them in bins you can easily pull out the bin and easily see at a glance what’s inside. I LOVE these! I put them on the bottom shelf which typically ends up like a black hole in our fridge where everything gets lost because it isn’t at eye level. Now we can put that space to good use and easily see what is on the shelf. 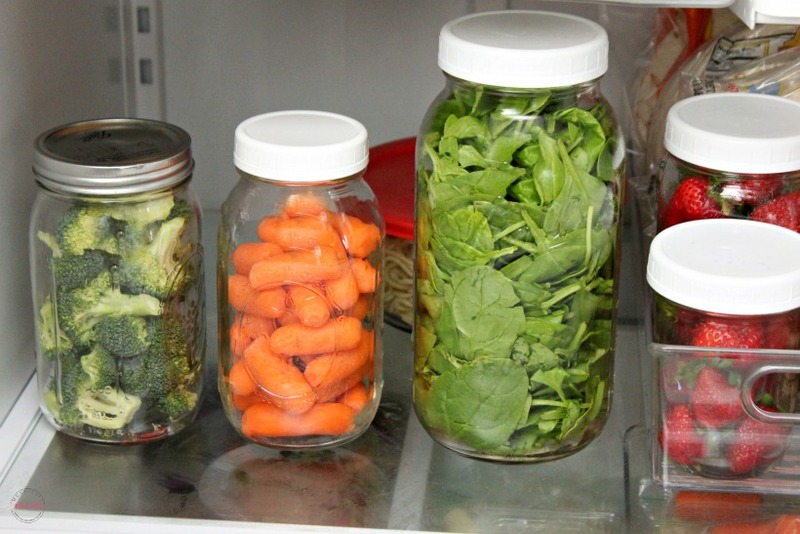 I love storing fruits and veggies inside glass mason jars. They stay fresh WAY longer in the glass jars than they do if I leave them inside the plastic bag or container from the store. As soon as you get home from the grocery store cut up, clean and store your fruits and veggies in mason jars and then place them in the fridge. They’ll last longer and you’ll waste less because they are prepped and ready to eat! I’m amazed at how many more fruits and veggies my family eats simply because they are ready to grab and go. I also used this soda can organizing bin to organize my zip top bags of cheese. We don’t drink a lot of soda but we do tend to have plenty of zip top bags in our fridge. 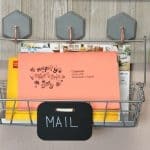 This works great to keep them all standing up and organized, but easy to grab. When we have parties I can swap out the cheese and add soda cans so guests can easily grab them. 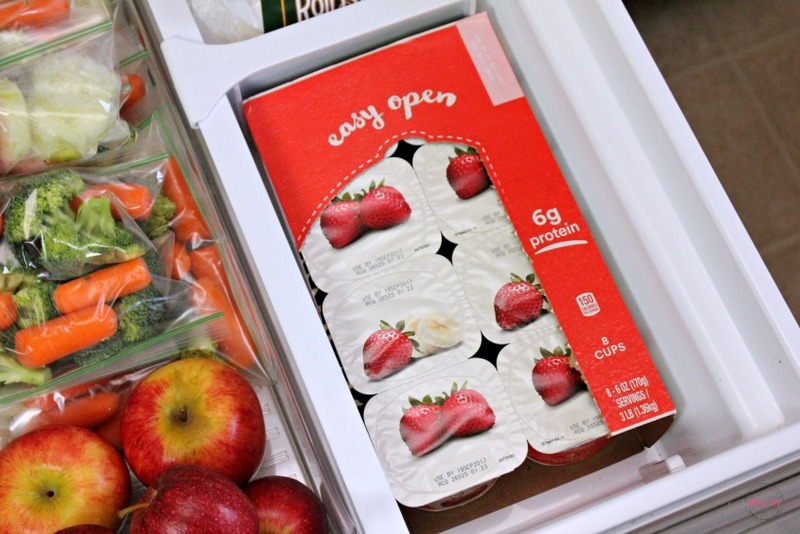 By implementing these easy fridge organization hacks we are able to make our mornings a little less hectic and snack time is now a breeze. 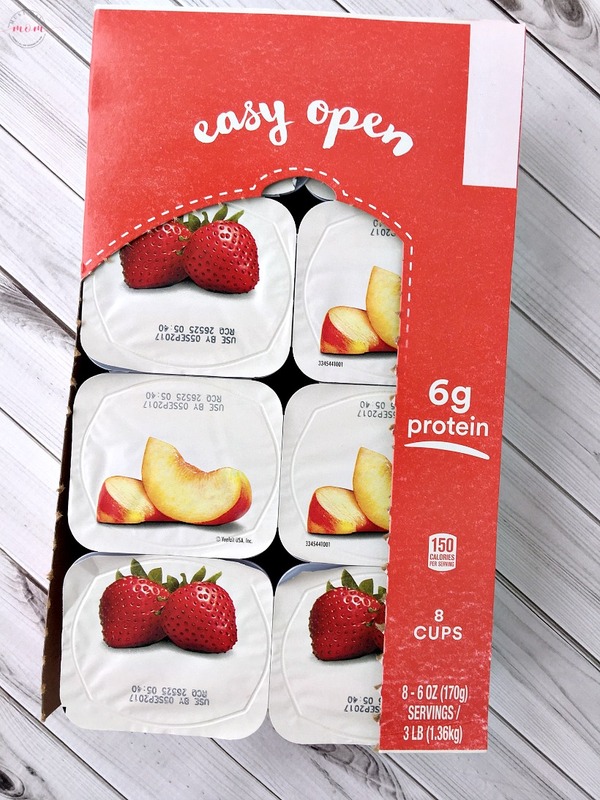 You can find everything we used in this post, including the easy grab and go Yoplait packs at Walmart! You can find all of these supplies at Walmart! Love your after photos and I’ll be stealing some of your hacks! Really like how organized everything looks now. The egg tray is genius not just because you can have them standing upside down but because it saves on having to clean up any spills. Anything that saves me from cleaning is a win! Thank you so much for sharing this! My fridge currently looks like a food bomb went off in there. Everybody just puts everything EVERYWHERE. This is fully awesome! 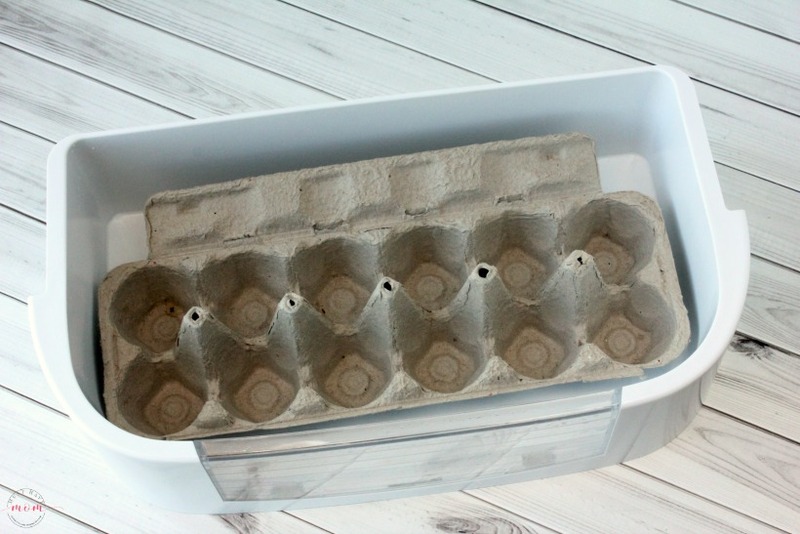 The egg carton hack is pure genius. No more bottles falling over. I love the idea of using bins! It would make it so much easier for the kids to find what they want! You can come and organize my fridge any day! My fridge is SUCH a mess! It could use organization! Haha I’m on an organizing streak. I love all of these ideas! I actually started organizing my fridge, but somehow I never finished! Definitely getting a few of these items and getting to work! My fridge is a mess and it drives me crazy! 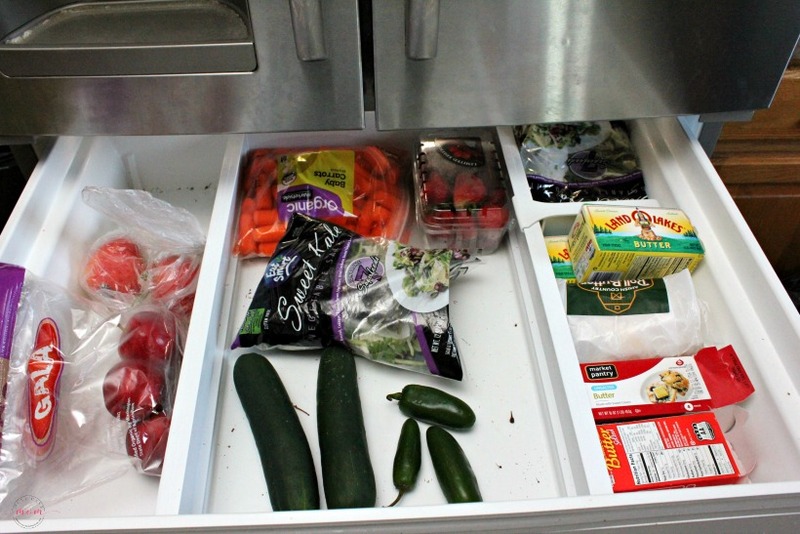 I need to try these fantastic fridge organization hacks. The egg carton hack is my favorite. I will have to do this on the weekend. It’s so simple but saves so much cleaning! My fridge is always disorganized. 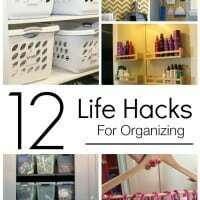 I am excited to clean it out this week and try these great hacks. My fridge seriously needs some help. I am going to have to put some of these to use. I need to do this to my fridge! I wish we had a snack drawer too! How convenient! I love the snack drawer. So handy for the kids to just grab a yogurt or snack themselves! I am totally fridge jealous right now! Organizing the fridge is on my To-Do list. 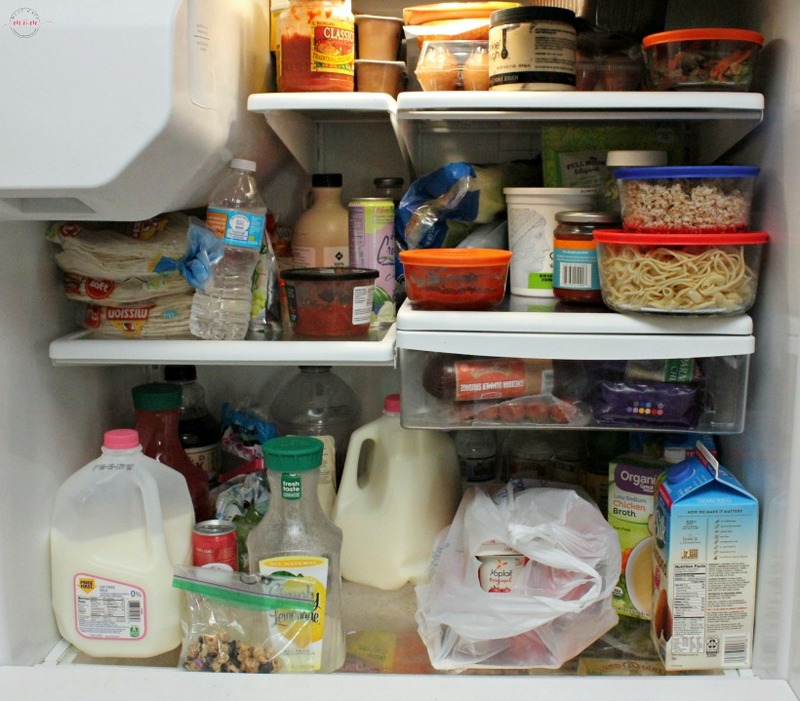 So essential during the school year to know exactly what’s in the fridge. I am on an organizing frenzy lol. The pantry is next on my list! Wow, great job. My refrigerator could definitely use some work. A week after grocery shopping it’s just a mess! What a before and after! Love how it came out, going to remember these tips! 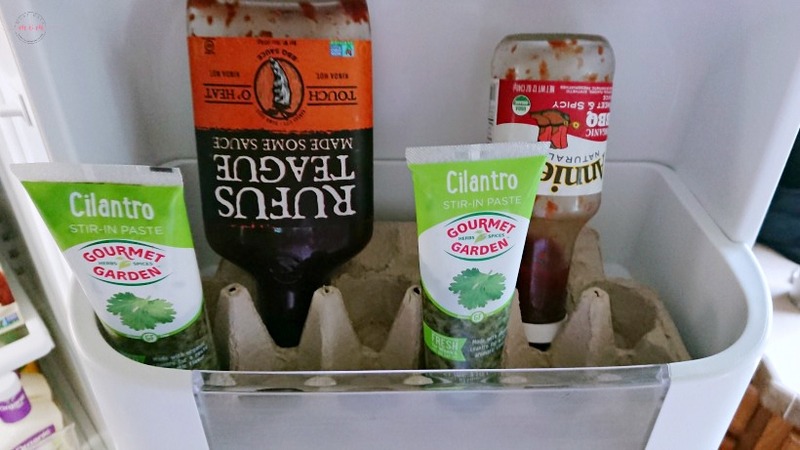 I am loving your fridge organization hacks. It doesn’t take much for our fridge to go from neat to messy. I’ll have to invest in some bins for the fridge. Yes, I can totally relate. Zero to disaster in no time! The bins definitely help keep it in check.